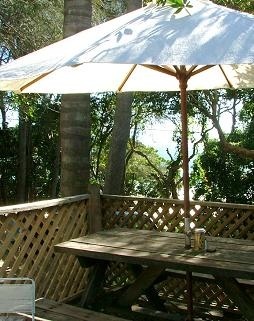 Byron Bay has many cafes and restaurants, you'll be spoilt for choice. There are a number of fine dining restaurants, numerous mid-range and plenty of 'cheap & cheerful'. We're more the 'cheap & cheerful' type with the occasional splash in the mid-range. Our personal favourite places to eat are listed below. This is not a reflection on any of the other fine eateries - more a reflection on our preference for familiarity - in short - we're lazy!! The Pass Cafe at the end of Clarkes Beach - we don't come here often but it is a great location and also does take-out. A great spot for a snack after you've been surfing at the pass. Clarkes Beach Cafe - a great spot overlooking Clarkes Beach - at time of writing it was closed down but we are told it is reopening soon so hopefully it will be operational when you're here - it's well worth checking out. Sushi - There are several sushi restaurants in town including Sushi Wave at the end of Byron Bay Pier arcade off Lawson Street (near the round-about with Jonson Street) and another located in the Woolworths carpark arcade area off Jonson Street. There are many more Byron Bay cafes and restaurants which we haven't included here, they are just too numerous to mention and the landscape of the cafe culture is very changeable. You will no doubt find many great places to eat and socialize but be warned - don't head out for dinner after 9 or 10 pm and expect to find a great selection of places to eat - part of the charm of Byron is how it has maintained it's small town ways too. Most places stop serving food after nine. We'd love to know where your favourite place is and why.